The Elevator Escalator Safety Foundation will host the 2nd Annual Chicago Cruise aboard the Summer of George on Wednesday, June 25, 2008. The inaugural event in 2007, which was held in conjunction with the National Association of Elevator Contractors (NAEC) educational seminar, was attended by more than 130 guests. 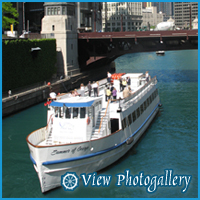 Attendees enjoyed sailing the locks of the Chicago River into Lake Michigan while enjoying Hors’ D’oeuvres and an open bar. The NAEC seminar was instrumental in attracting attendees to the cruise while cultivating the local industry in an educational setting. This year’s cruise check-in will begin at 6:30 p.m. with boarding at 7:00 p.m. There will be a Hors D’oeuvres, open bar and a DJ on the top deck. This is an excellent opportunity to network with fellow Chicagoans as well as a nice way to say thank you to your customers. Sponsorship opportunities are available. For details on sponsorships and registration information, please click the brochure link below. The mission of the EESF is to educate the public on the safe and proper use of elevators, escalators and moving walks through informational programs. In order to do this and increase our goal each year, it is imperative we maintain and increase the current fundraisers and look for other fundraising opportunities around the country. The Chicago Cruise is one of the newest fundraisers EESF has directed. The idea was taken from the ever-successful National Association of Vertical Transportation Professionals New York Region Dinner Cruise which happens in August. The NAVTP-NY event contributes $15,000 to the EESF mission each year.